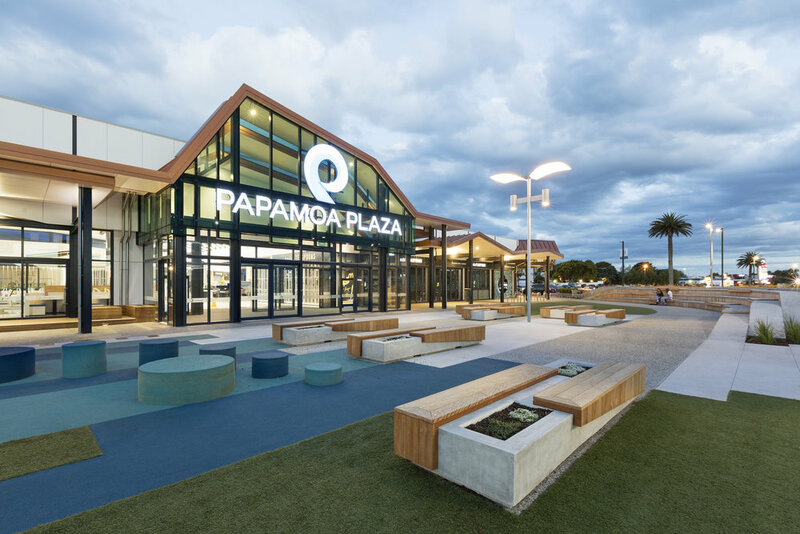 The completion of a second stage of development at Papamoa Plaza has not only increased leasable space, but also woven in the colours and landscapes of the local area. Existing facilities have been updated with key design accents to ensure a cohesive look. Papamoa Plaza is located in Tauranga’s largest suburb. The redesign and extension was managed by Ignite’s specialist retail team over a series of stages – the first of which commenced in 2014 when the centre received a new façade, refreshed retail branding and new shop fit-outs for some tenants. Stage two of the project began in early 2015 and included a 6,000m² extension to the existing 10,000m² building. This included a new foodcourt with six speciality retail tenancies, dining area, new amenities and an external plaza. Existing amenities were also upgraded. The design drew inspiration from the nearby beach and sand dunes. A vision of decking and tussock dunes, rustic and natural timber forms and nautical elements like mooring ropes, have created the coastal theme. As a nod to the local area, the regional colours of yellow and blue are included. The idea of a sophisticated beach shack is evident in the new foodcourt fit-out – starting with the timber canopies over each retail tenancy. The undulating nature of sand dunes is reflected in the external roof canopy of copper aluminium, offset by dark steel structure. Stage two of the project has seen the canopy continued along the entire centre’s perimeter. Along with providing a design statement, each of the main entry points to the Plaza are now clearly defined. Full-height glazing flood the new foodcourt area with natural light. Four bespoke lighting statements – copper-colour perforated steel ‘seagulls’ – are strategically hung along its centre. These echo the form of the Plaza’s exterior canopy. A variety of seating options and configurations are offered to create different experiences for the customer. Along with standard dining tables and chairs, a separate cabana area was created on a raised ‘deck’ to provide for more intimate dining. Bespoke oversized tables cater to group and communal dining, while raised counter-tops and barstools provide spaces for those awaiting food orders. Bench seating and ottomans, featuring Bay of Plenty blue and yellow coloured squabs, are tucked alongside the cabanas for those just seeking a place to rest. The different seating zones are identified via the use of vertical rope screens. Dark steel structure is used both internally and externally to provide continuity through the design. The idea of a sand-covered floor is evoked through the use of taupe-coloured tiles, which are interspersed with white-gloss accents. A new, multi-purpose outdoor area leads directly off the foodcourt. This is designed to provide a space for the community to gather, attend events and entertainment – or simply enjoy dining outdoors. The plaza is divided into two zones. To the right, an undulating artificial turf zone offers a space for children to play. Colourful stepping stones, in Bay of Plenty blue, provide options for exploring or sitting. Rubberised safety matting runs underneath. The blue feature colour ‘washes’ into a gathering area, on the left. A concrete and timber amphitheatre anchors the space and its undulating lines again reflect the nautical inspiration. Embedded timber seats are strategically placed to provide a suggested use. The concrete is cast to appear as timber panelling, reflecting the timber features of the new foodcourt. Smaller seated areas, using a similar material palette to the amphitheatre, are positioned at the secondary entry points to the Plaza. New amenities have been added with a second set of bathrooms and a parent’s room. A striking beach photo by a local Bay of Plenty photographer takes pride of place at the entry point to this area. Timber panelling, and strategically-placed sea green and aqua wall tiles, add to the beach theme. A neutral colour palette of cream-coloured floor tiles and white wall tiles are used for the bathrooms. This complements a metallic copper splashback, which is subtly lit by a recessed LED strip. The parent’s area features a similar splashback in blue tones. Private and communal feeding areas are offered using the blue and yellow coloured seating of the new foodcourt. A small play area is also included. Feature lighting has been added to the existing interior thoroughfare to provide a point of interest, as well as subtly direct foot-traffic past the retail tenancies and toward the foodcourt. This series of aluminium, angular lengths are inset with LED light panels, which are positioned at different lengths to create the idea of organic movement. The existing white-painted, square structural columns in the thoroughfare have been softened with sea-green glass panels, inset with a natural-coloured timber framework. This gives a nod to the green glazed elements featured in the exterior entry elevation. Sand-coloured accents now offset the white floor tiles to evoke a beachy feel.